In 1961, Jerry and Joyce Rockvam opened a boat repair shop in Spring Park, Minnesota, with a dirt floor and no utilities. 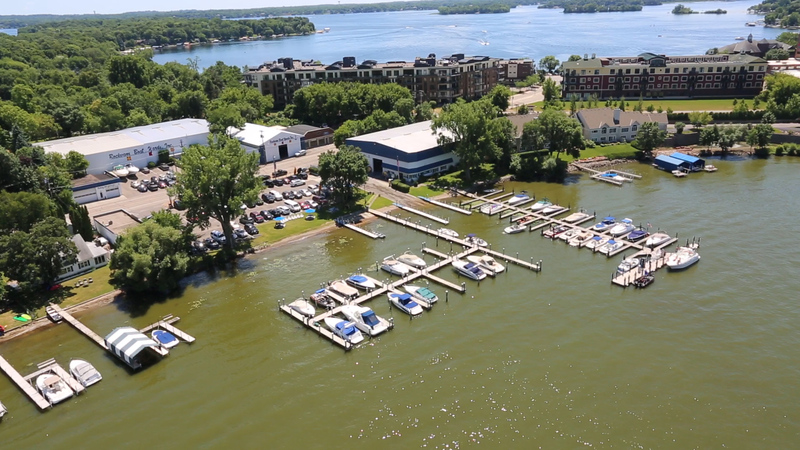 Fifty-seven years later, Rockvam Boat Yards Inc. has redefined recreation on Lake Minnetonka, a body of water with 28 inter-connected bays and 110 miles of shoreline. Jerry and Joyce still work at the marina everyday, joined by their daughter and general manager, Roxanne Rockvam. The story of Rockvam Boat Yards, like many marina family businesses, began long before the marina with the Rockvams and their connection to the water. “I was raised in the boating business. It was nothing new to me,” Jerry Rockvam said. He grew up in the boating world at his family’s resort on Lake Minnetonka. The resort, called Roxy’s, had a restaurant and many fishing boats. Jerry’s father also manufactured a fiberglass boat called the Darling. At 18, Jerry Rockvam started his own dock business, called JP Rockvam Dock Enterprises. The next year, he married Joyce. They were 19 and 17 and had to get their parent’s signature in order to marry. They operated the dock business for two years until 1959, when Jerry entered the U.S. Navy. They moved to Virginia Beach, and Jerry served in an attack squadron on the USS Forrestal. Jerry completed his military service in February 1961, and in March, he and Joyce opened the boat repair shop. Joyce also worked as a secretary at Advance Machine Corporation. It was two blocks from their home, so even during blizzards, she had to go to work because she could walk there. She did that for two years, before going full-time at the boatyard. In 1966, the Rockvams purchased the section of lakefront property, where their home, the ship’s store, office and fuel dock were located. Since then, Jerry and Joyce were able to purchase a townhome next to the boatyard property, where they live now. The marina and boatyard business has grown from a small repair shop to wet slips, full-service repair, dry storage, winter storage, boat club, boat rentals and more. Rockvam Boat Yards has many great stories to tell about its business success, its dedication to boaters and tourism on the lake, and how a family business brings customers into its traditions. For this and many reasons, Marina Dock Age magazine is honored to call Rockvam Boat Yards its small Marina of the Year for 2017. Rockvam Boat Yards and Jerry Rockvam led the industry in many areas. The original marina had a pumpout facility in 1961, long before those were popular or regulated. The marina was one of the first to introduce the drystack concept to the area. The Rockvams took a trip to Florida in 1968 and visited some marinas, which were starting dry storage service. They returned to their marina with an eye on starting a storage business. They had a building to accommodate rack storage, but it was almost too early for the market there. “You had to explain to everyone was it was. So we waited,” Rockvam said. And, in 1982, Rockvam Boat Yards built another storage building and started the drystack business – still ahead of its time in the area. For 37 years, Jerry Rockvam served as mayor of Spring Park, and when he retired, he finally found the time to start the Minnesota Clean Marina program. In 2000, at a marina management course in Page, Arizona, Jerry met Rocky DeSimones, who started the CleanMarina program in Florida. DeSimones presented the original idea to the group, one that Jerry always wanted to bring to Minnesota. When he retired from local government, he got the chance. By 2008, Jerry had gathered a task force of 17 marinas. Along with local government agencies, they set up a non-profit, created the program guidelines and raised funding. Jerry served as president of the program’s board of directors. With support from the Minnehaha Creek Watershed District and an original $5,000 donation, the group created the best management practices publication. That funding spurred others, including in-kind donations from the Minnesota Department of Natural Resources and Attorney Time for the 501c3 status. In the fall of 2012, Rockvam Boat Yards became the first of five original Minnesota Clean Marinas. The program progressed slowly, as all the administrative work was done on a voluntary basis, and the state needed a lot of education on the initiative. In the spring of 2017, that changed. Roxanne Rockvam created the “Minnesota Clean Marina Fast Track” program. “We found that sitting down and completing the work book is the biggest hurdle to certification. It is not a lack of desire, but a lack of time,” Roxanne said. She introduced the Fast Track program to help marinas dedicate time to the certification process and paperwork. The open house event was held at a central location and invitations went out to regional marinas. Operators got a free lunch and help to complete the paperwork, and it was a huge success. At the first open house in March 2017, they received 10 completed applications for the Minnesota Clean Marina program. As of September 2017, the program had 18 certified marinas. The next goal for the Minnesota Clean Marina program is permanent funding from the Minnesota legislature. State Senator Dave Osmeck has sponsored a bill for $100,000 for the program. “The ultimate goal is to target the state gas tax,” Roxanne said. Currently, all gasoline tax from fuel sold at marinas is allocated to Minnesota road funding. “We think if the gas is sold on the water for boats, the tax should go for clean waters, and we feel the Minnesota Clean Marina program is the perfect guardian,” she said. Rockvam Boat Yards started in 1961 and has grown and expanded many times. Rockvam Boat Yards has always been consistently focused on its own growth. Adding facilities, amenities and more profit centers to support the business and recreation on the lake. The sidebar on this page lists the major renovations for more than five decades, expanding slips, upland facilities and services. For almost a decade, Rockvam Boat Yards has operated a boat club, seeing customers move from private ownership to shared membership. “We are happy to serve these customers and to introduce them to boating,” Roxanne said. Additionally, the program has been a major revenue generator for the business. Instead of collecting one private slip payment for a boat in the water, the marina collects seven memberships per boat in its program. Boat club members can draw in even more revenue per slip than long-term customers. Rockvam Boat Yards still wanted to maintain its slips for long-term customers, so it operates the boat club on the drystack model and launches boats on demand. They can continue to buy boats and sell memberships as their dry storage warehouses fill up. The boat club business has also picked up recently. In 2016, the club started with 22 members, and Rockvam Boat Yards ended the season with 48 boat club members. Rockvam Boat Yards employee 10 full-time employees and up to 35 during the summer season. Boat rentals are a big profit center for the marina and started in 1989. Lakeshore property is very expensive and providing regular and affordable boat rentals is important to tourism on the lake, Roxanne said. Its fleet of fishing and pontoon boats serve around 8,000 visitors a summer. 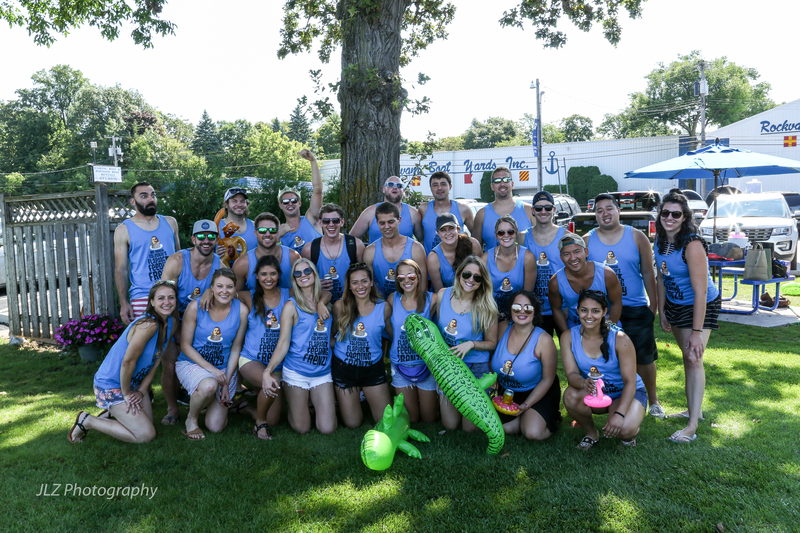 In 2012, Rockvam implemented an online reservation system for boat rentals, which brought a 28 percent increase in sales, along with increased scheduling efficiency. The service business is the core of the marina. The boatyard supports the boat club and rental fleet throughout the season. 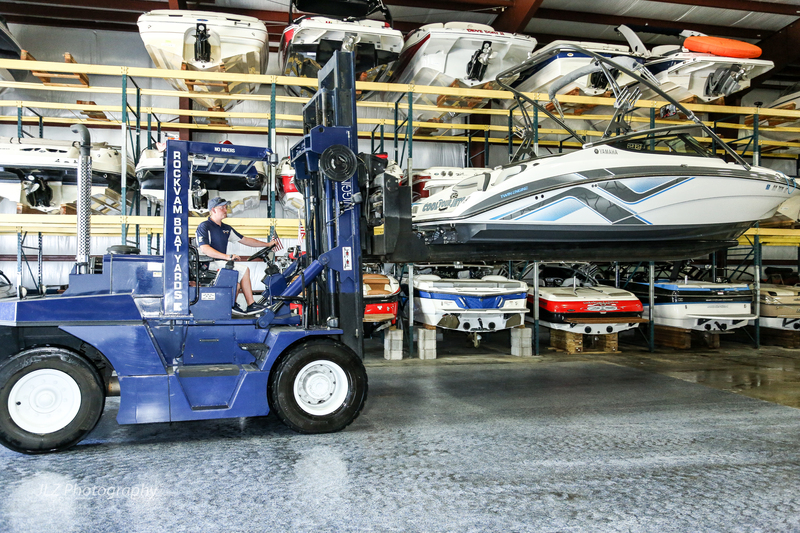 The marina’s full-service winter storage business keeps the boatyard busy all year-round. Customers drop of their boats at the fuel dock in the fall with service requests and pick up the boats in the spring. In between, the boatyard does winterization, service reviews, spring starts and lake tests. Rockvam can store kayaks and boats up to 43 feet in length. Of course, Rockvam Boat Yards isn’t done growing and improving. Its plans for the future include using automation, improving its digital presence and renovating the ship’s store. Rockvam would like to become less dependent on staff, especially part-time staff in the summer. To accomplish this, the boatyard is looking to implement automation where it can. The first project will include automating the fuel dock. While attendants will still be on-site, a pay-at-the-pump service will make that more efficient for guests and staff. The marina’s original pontoon and boat club websites were successful in boosting sales, but they have since become old, even obsolete. In addition to a regeneration of these websites, Rockvam Boat Yards wants to integrate other daily tasks, such as creating contracts and schedules, all with one CRM program. The marina said this will save about one hour of staff time per day. Currently, all dry storage customers must manually schedule drop off/pick up with the staff. A new website will automate that process as well. The ship’s store at Rockvam Boat Yards will be reimagined. With 8,000 guests a summer, the marina feels like it can capitalize on more sales. They are considering a fast lane check-out service for members, or an app to help automate sales. The marina thinks a lengthy weight time in the store for items like a bag of ice can affect sales, and they want to help automate or expedite purchases. 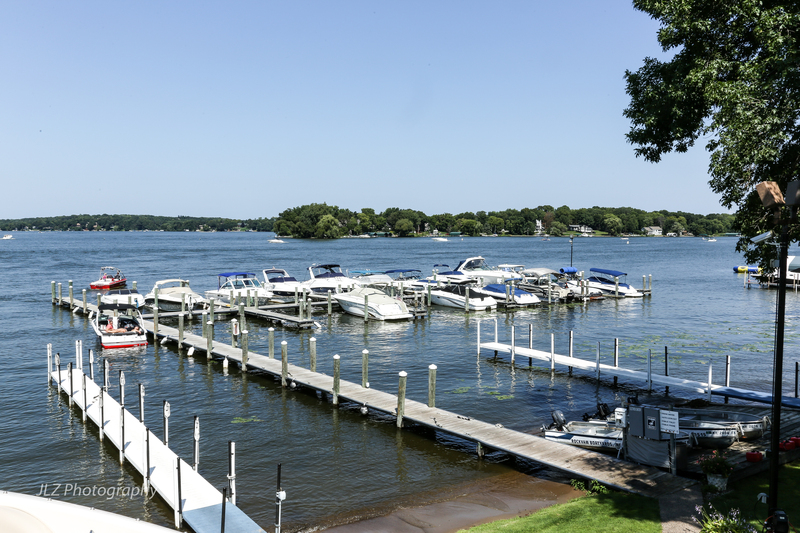 The marina has additional ideas to automate the pontoon rental process, create a scholarship program for part-time employees, and add more vessels to the boat club. The list goes on. One of Rockvam Boat Yards’ most innovative and creative business practices is how it markets and advertises to customers in the digital age. 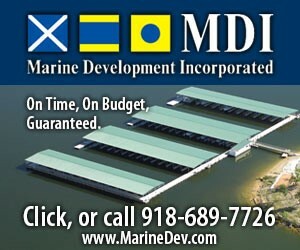 With so much to be learned there, Marina Dock Age will feature these marketing practices in a future article. The marina operates its boat club from the dry storage facility and launches boats on demand. This article is only a small glimpse into the many successful profit centers at Rockvam Boat Yards. The business will never stop changing with the market and looking for ways to serve new customers and serve long-term customers better. Jerry Rockvam shared a story from early on in the business, which taught him a valuable lesson. The Rockvams bought the first lakefront property in 1966 and moved there. An old couple that owned the property next door with a number of cabins told Jerry that he needed those lakefront cabins, and he gave Jerry a price. At the time, Jerry thought he couldn’t afford to do it. It wasn’t too long before another developer bought the property that he realized his mistake. 2016: Insulated Warehouse 4 to provide indoor heated service.